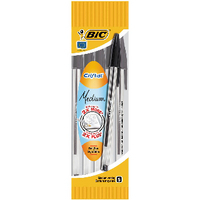 Bic Cristal Ball Point Pens. Best selling ballpen with excellent performance and ventilated cap for safety. Medium tip. Colour: Black. Approx Dimensions (CM): D22 W12 H8. Approx Weight (KG):0.2581.